Smart, entertaining, a well written script, a delightful young female star. What? Where did this one come from? I had seen the trailer shown before some other movies as of late but hadn't considered seeing it since it seemed like a teenage comedy targeting the youth market. Cinema Clock has a comments section and during an idle moment I read some of the remarks about the film. Curiously, the comment section allows the commentator to give a date range for their age. Several 50+ had said the film was good. I scratched my head then went to Rotten Tomatoes. What? The film garnered 86% by the critics? 86%? That's pretty high, in fact, that means the film is good. Well, I'm just back from the theatre and everybody was right. The cast was excellent and it was surprising to see faces I recognized like Thomas Haden Church, Lisa Kudrow, Patricia Clarkson, Malcolm McDowell and Stanley Tucci. Mr. Tucci is a wonderful actor and even though his part was small, he is just excellent. 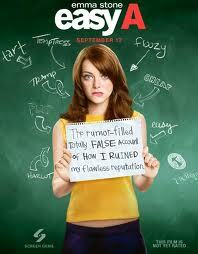 The female lead, Emma Stone as I said was delightful and I'm sure is going to go places. However, for me the interesting thing to discover was who wrote the screenplay. Emma did a great job but who put those words in her mouth? It seems we have a 33 year old named Bert V. Royal who is so new on the scene; he doesn't yet even rate an entry in Wikipedia. After digging around, I found out that Mr. Royal quit his profession as a casting director to write an award winning play and now finds his name on the marquee as screenwriter for this movie. Hats off to him. He has given the female lead some terrific dialogue both as a character within the story and as narrator for the film. This writing is so smart I would have a hard time believing that any 18 year old could truly be that literate and witty. By the way, I'm always curious about a film's profit. From what I discovered, the budget for the film was $8 million and so far it has grossed $52 million. That's a 550% return on the investment. [Nods head] Not bad, not bad. In comparison with some of the other films I've reviewed lately, that is an excellent margin. All in all, this was a surprising little charmer of a film. I was quite pleasantly surprised. I'm sure that a 58 year old at what seems to be a film for a younger group seemed strange and yes, it was strange for me at first but after 10 minutes, I realized I was going to be in for a treat. This Bert V. Royal wields a deft pen and I will be keeping an eye out for that name in the future. I'm speechless, i share the same thoughts on the movie. At first i didn't want to go see it either. My friends persuaded me on doing so, and I'm glad they did. The movie is awesome, and not pretentious as i feared. Rob Ford: Day #1, promise #1? Toronto Mayoral Race: This is it folks! The Mayoral Debate: Now where do we stand? Let's go green... er, black? Nice doggy. Ahhh! What the heck? ZipCars: I've seen the future, and it works. Domestic flight: Only carry-on... oh damn!